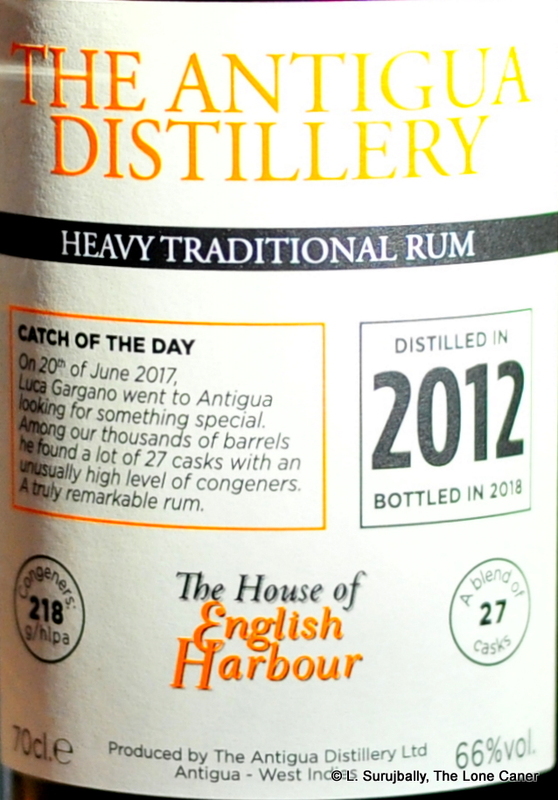 Not only was the Antigua Distilleries’ English Harbour 1981 25 YO the very first rum review posted on this site, but for a long time it was also one of my personal top sipping rums (as well as the highest priced), and ever since, I’ve had a fond place in my heart for their work. 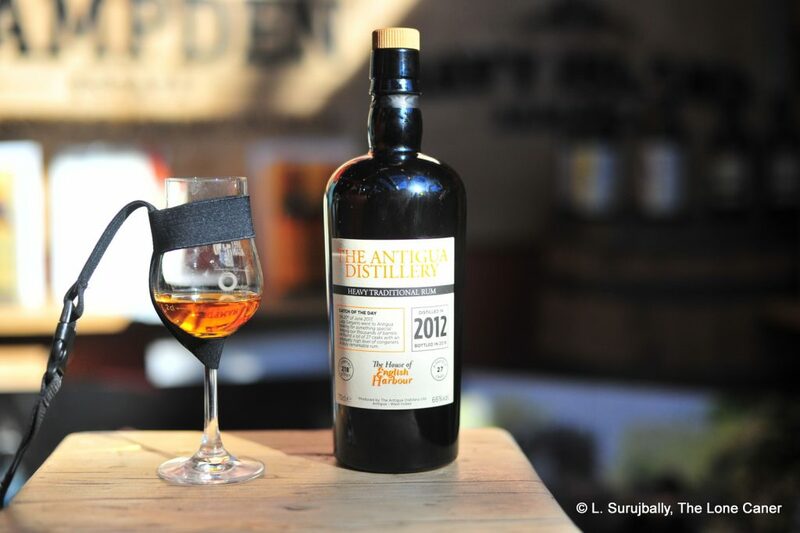 In 2017 I tried their new sherry matured rum and was impressed and intrigued at the directions in which they were going – but the 2012 rum issued the following year as part of the Velier 70th anniversary collection, that one was something really special. I haven’t tried the single barrel offering at 68.5% from this batch, but for my money, this one at 66% is among the very best from Antigua I’ve ever tried. To be honest, the initial nose reminds me rather more of a Guyanese Uitvlugt, which, given the still of origin, may not be too far out to lunch. Still, consider the aromas: they were powerful yet light and very clear – caramel and pancake syrup mixed with brine, vegetable soup, and bags of fruits like raspberries, strawberries, red currants. Wrapped up within all that was vanilla, cinnamon, cloves, cumin, and light citrus peel. Honestly, the assembly was so good that it took effort to remember it was bottled at a hefty 66% (and wasn’t from Uitvlugt). The taste was similarly excellent, attacking strong and firm without sharpness; it was gently phenolic, with a hint of acetone, balsamic vinegar, veggie soup and crackers — nothing overpowering, though. These flavours were kept subservient to the more forward tastes of caramel, toffee, white toblerone chocolate and crushed almonds, and as I waited and kept coming back to it over a period of some hours, I noted flambeed bananas, salt butter and a very strong, almost bitter black tea. It all led to a rousing finish, quite long and somewhat dry, showing off final notes of aromatic tobacco, almonds, unsweetened chocolate, vanilla and yes, of course some caramel. Wow! This is quite some rum. It’s well balanced, just a little sweet, tasty as all get out, and an amazing product for something so relatively young deriving from a column still – I’d say it is actually better than the 1981 25YO. It has enormous character, and I’d hazard a definitive statement and say that to mix it or add water would be to diminish your drinking experience – this is one of those hooches best had as is, honestly, and it delights and pleases and leaves you with a twinkle in your eye all through the tasting and after you’re done. Velier, who distributes the 2012 is not, of course, an independent bottler — if they were, they’d hype themselves out of shape, market the hell out of their own releases as Velier bottlings, and never give the kind of prominence to the distiller of origin as they have since the Age of the Demeraras. Luca has always respected the source of his rums, and felt he acted as a facilitator, an educator, bringing together three points of the triangle – his own ideas, others’ best rums and the audience’s amorphous, oft-unstated, unmet and unarticulated desires. At the intersection of these forces lies the desire to find, to chose and to issue rums that are brilliantly assembled, superbly tasty, and exist to shed new sunshine on the land of origin in general and the distillery of make in particular. That’s exactly what’s been achieved here, with every one of their wishes being granted by what’s been trapped in the bottle for us to enjoy. Luca selected 27 barrels from the 2012 production of Antigua Distillers, but one was so exceptional he released it on its own at 68.5%. The remaining 26 barrels were blended into this rum. The information is not noted anywhere but calculations suggest the outturn is just around five thousand bottles, maybe a shade more. Some other reviews of this rum are from the Rum Shop Boy (scoring it 91), and Single Cask Rum (no scoring). The latter review has some good historical and background details on the company which are worth reading. But please notice the 218 g/hlpa count is for total congeners, not only esters. This is the reason it is so different from the Jamaicans – the ester count is likely much lower than 218. There are other types of molecules involved, responsible for all the flavoures you noted. These likely include phenols, aldehydes, ketones, and others. In my limited understanding, a total of 218 g/hlpa congeners is in fact not particularly high. It great that it is mentioned on the label though! Thanks for the correction Assaf, you’re absolutely correct, and I’ve amended the wording appropriately. I agree the levels are somewhat on the low side, but having just come off the NRJ series of rums, and the Galion, I appreciate the subtlety and grace of something like this a whole lot more.